Are you tired of that huge, clunky, horsepower-stealing York or Tecumseh compressor sitting on your engine and stealing its thunder? You’re not alone. 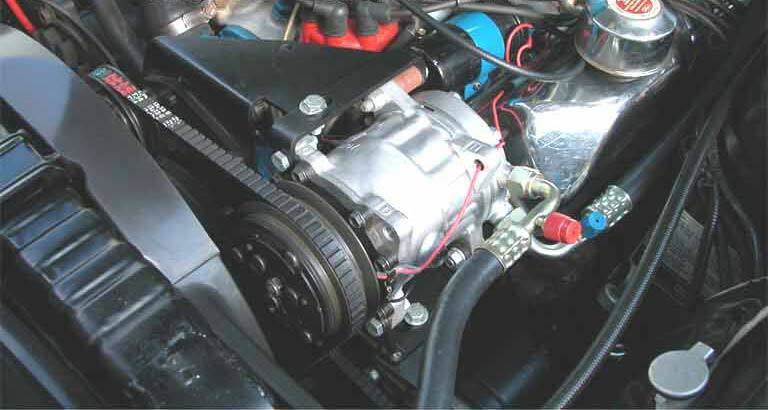 Why Upgrade Your Ford A/C Compressor? High-performance 134a and R12 Sanden-style model specific conversions are supplied with a Sanden-style compressor, and all required adapter brackets, idler pulleys, compressor hoses, o-rings, refrigerant tape, and Mustang & Cougar kits include a filter-drier. Mustang & Cougar and 1958-66 T-bird kits are pre-made with factory crimped fittings. Excellent attention to detail makes for a very attractive under-hood appearance and an easy installation. High horsepower engines – No problem! Sanden-style’s high efficiency compressors have a continuous duty rating of 6,000 rpm and require an insignificant amount of power to turn. Stock compressors can handle much less RPM. Build up your engine and rev it up to leave someone in the dust and your stock compressor could lock up. 134a Conversion Kits are identical to the R12 Kit except supplied with a 134a compressor and proper hose fittings for system charging. 134a removes a higher heat load from the interior, so it is extremely important for the fan clutch and condenser to be in excellent condition on any 134a conversion. More on Converting to 134a! Although the original condenser will work, we highly recommend our new 6 circuit reproduction condenser. If you drive your Ford daily, then our extremely popular Sanden-style conversion is a must have option for your factory A/C system. We’ll even take your old clutch as a trade, or buy it outright when your installation is finished. Average trade-in value of correct original clutch is $25.00. * 1964½-73 Mustang, 1967-73 Cougar & 1958-66 T-birds all have pre-made hose assemblies. Not all kits include a filter-drier but we can custom restore your original. 1964½-73 Mustang, V8 and 6 cyl. 1964-65, 1970-71 Ranchero V8 & 6 cyl. 1964-65 Comet V8 & 6 cyl. 1964-65 Falcon V8 & 6 cyl. 1958-66 Thunderbird V-8, R12 & 134a.